SCC is not a static snapshot: How do your farms behave? Most dairy vets need to deal with their clients’ milk tests going on for months. Processing such an enormous amount of data can be confusing. 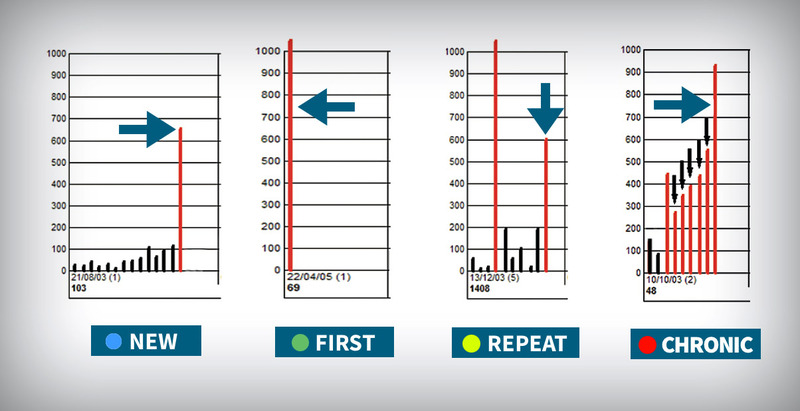 In this post you’ll find some basic guidelines to help you evaluate the infection dynamics on your clients’ farms and assess and monitor the risk of mastitis in cattle based on the Somatic Cell Count. WHAT CAN INDIVIDUAL COW SCC BE USED FOR? Historically when Individual Cow Somatic Cell Count were introduced in the late 1980s, cows were just listed in descending SCC order resulting in a static snapshot approach as there was no attempt to assess changes to SCC dynamically. More recently in the last 15 years, SCC analysis & management systems have been developed utilizing computer software where dynamic correlation of changes of SCCs or more particularly change of infection status using most often a 200,000 cells/ml threshold gives an indication of infection dynamics during (a) lactation and (b) across the dry period. During lactation, cows can be divided into 4 status categories of likely infected cows and 3 status categories of likely uninfected cows. New: not the first milk recording in the lactation but the first with a high SCC Apparent New Sub-clinical Infection [ANSI]. First high: both a high SCC and the first milk recording in a lactation. Repeat: a high SCC for at least the second time in the lactation, although following a low SCC at the previous milk recording. Chronic: a high SCC at both this and the previous milk recording. First low: both a low SCC and the first milk recording in a lactation. Recovered: a low SCC level following a high SCC. 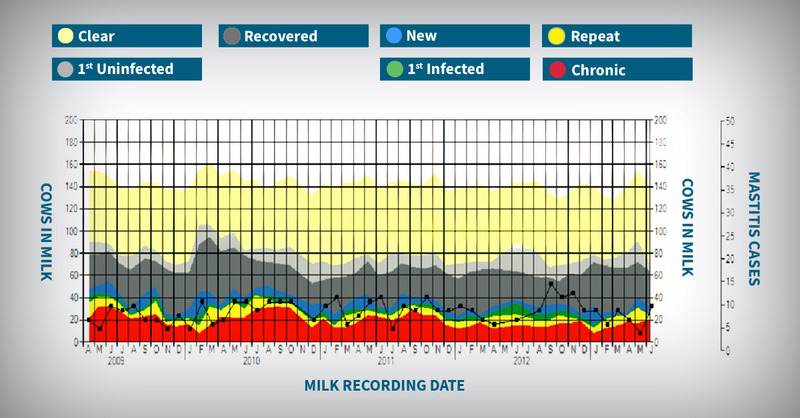 Uninfected: a low SCC at this and the previous milk recordings. During the dry period cows can change their status in four ways (Using 200,000 cells/ml as a threshold to determine infection status). Uninfected cows remaining uninfected during the dry period. (Target > 90% of cows drying off low ie dry period protection rate). Cows eliminating an infection during the dry period. (Target > 80% of cows drying off high ie dry period cure rate). Cows acquiring an infection during the dry period. Cows acquiring a new dry period infection are given a First New category. Cows remaining infected through the dry period. Cows failing to cure a dry period infection are given a First Chronic category. Author: Andrew Biggs, Consultant on bovine mastitis and cattle health.